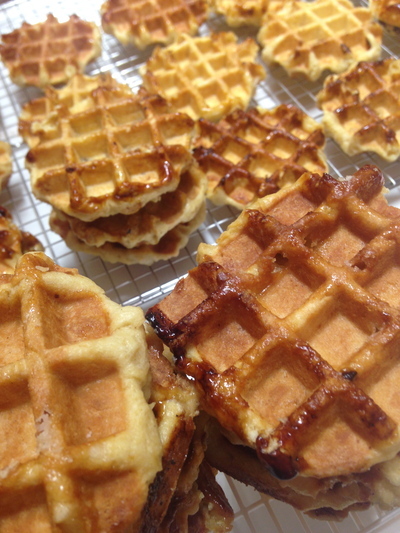 Those waffles sprinkled with warm chocolate or some coulis, of which just melt in your mouth. There is a place at Darling Harbour that comes to mind, and they're rather filling too. If you love chocolate, you'll love these waffles. Where is the best place to enjoy a couple of tasty waffles in Sydney? They are great. Especially with lashings of melted chocolate...mmmm. Personally, my favourite waffles are from the Lindt Cafe. They're always yummy and moist, and the toppings are great. Also, the Chocolate Room on Bathurst street is famous for more than just chocolate. One of their signature dishes is waffles and they are lovely, tasty, and perfect with one of their many hot chocolates! Max Brenner hands down has the most delectable waffles and their locations hav exploded with the recent so there is bound to be one near you. My favourite location is the one near Wynyard Station in the City. Its even got alfresco seating! I recommend the Tutti Fruitti Waffles with Chocolate Icecream, and if you are daring a Strawberry Float Milkshake to wash it down. Having worked at Max Brenner for 3 years of my life, I can safely say the waffles are indeed the best (no bias, I promise). I have tried waffles elsewhere and they just don't compare to the quality at Max Brenner. It is a little expensive though! Best high tea in Sydney? Best amusement park in Sydney? Best way to unwind in Sydney? Best places to go bike riding in Sydney? Best thing to do on your birthday in Sydney?